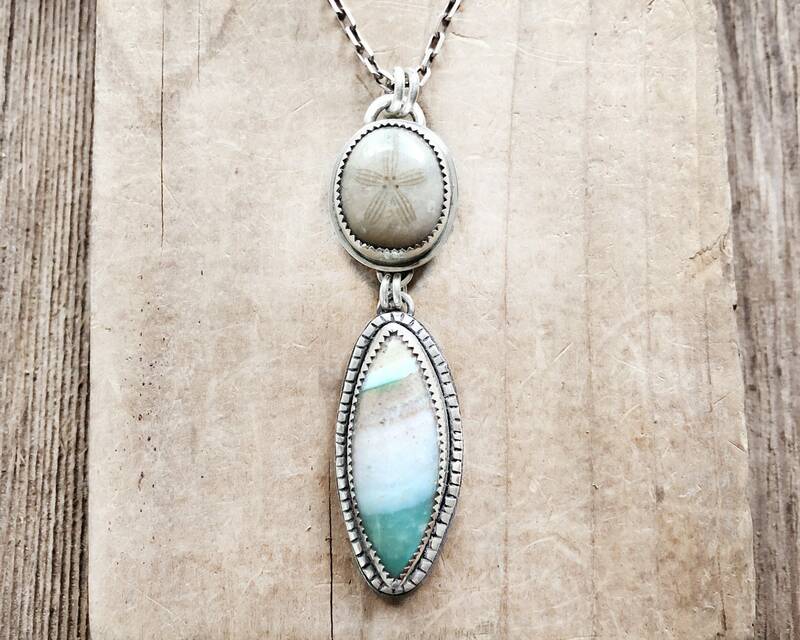 A fossilized sand dollar adorns this pendant, as well as beautiful piece of opalized petrifed wood from Indonesia. This is a new gemstone that was discovered recently and is my new favorite! The setting is sterling silver and was entirely handmade by me in my northern California studio. The pendant measures approximately 2 1/2" tall, or 63mm, including the bail. You have your choice of 16", 18", 20", 22", 24" or 30" sterling silver chain. It's shown on 22" and comes in a recycled gift box tied with a raffia ribbon, ready for giving. Please see all photos for different views and note that colors may appear differently on your monitor. This piece is ready to ship and will be sent via USPS priority mail within the US, first class everywhere else. Love my necklace. I’ve worn it daily since my little guy passed away. The chain is beautiful. really beautiful work of jewelry, looked even better in person than on the picture, was a terrific gift, arrived just in time. Thank you very much! Sphynx Cat Necklace Handmade in Silver - Dainty!